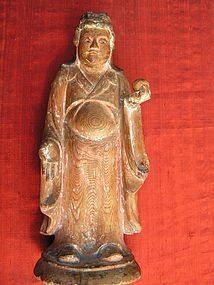 Edo period presentation of Kishidjo Tennyo, made of cypress wood, with glass eyes, with traces of gesso, color pigments and powder of clam shells, holding in her left hand the sacred gem. With two purchase documents from Uchida, Kyoto, 1970, dating the figure to the 17th century. Measurements: 17 1/2". 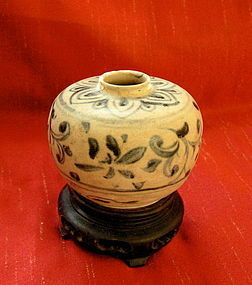 Small underglaze blue white jar, probably export ware. Glaze imperfection or restoration at mouth. Measurements: H 2 1/2". Decorated with dragon emerging from clouds. 19th century. Measurements: H 7 1/2", D 9 1/2". Provenance: Acquired 1968/71. 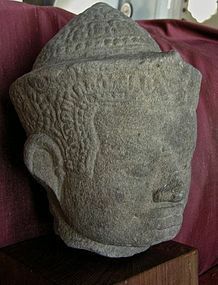 A well carved head of what appears to be King Ramkamhaeng with elaborate diadem and conical headdress. The head probably dates from the 13th/14th century. 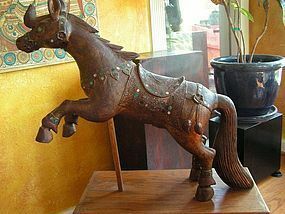 Provenance: Acquired 1968-1971 from a private collection in Thailand. Measurements: H 10". 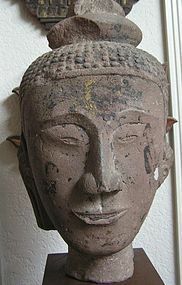 A very finely carved and large Buddha head, Ayudhya style and period (1351-1767). 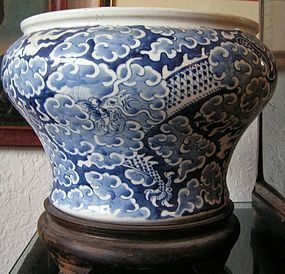 Provenance: Acquired 1968/1971 from a well known Thai collection. Measurements: H 16". 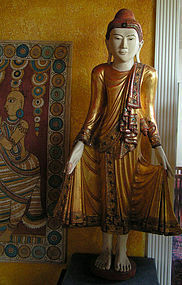 At the time of acquisition in 1968 the piece was said to have been in the fire when the Burmese conquered and burned Ayudhya in 1767. The bronze figure was acquired from a diplomat's collection in 1968/1971 who had owned it for some twenty years, and was in turn acquired from a Thai prince whose family had owned the piece for some time. Measurements: H 19". 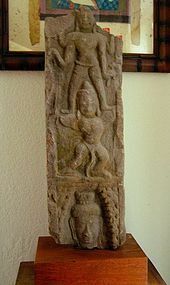 Red sandstone carving, probably of a door post, showing Vishnu on his vehicle the Garuda. The piece, originating from what is today Thailand, dates from the time the Khmer empire extended into Thailand with its capital at Lopburi. Approximately 13th century. Provenance: Acquired 1968/1971 from a Thai collection. Measurements: H 30". 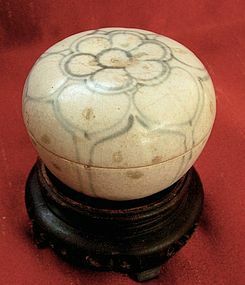 Chinese covered box with blossom motif. Some discoloration but does not detract from charm of this piece. Measurement: H 2 1/4". 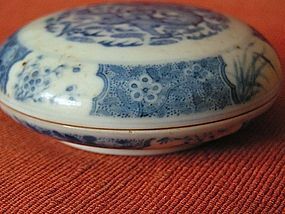 Underglaze Blue White Chinese Porcelain Seal Box; 19th century with Qianlong mark. When the box was acquired in 1973 from a dealer in Washington, D.C., it came with a description explaining that the box dated to the early or mid 19th century, that it was transfer with details painted, especially the medallions on the side and that it was very fine work. 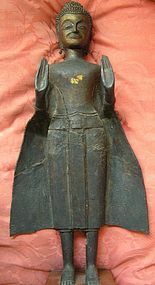 Standing on lotus base, the gilt and lacquered figure is decorated in subdued fashion with mica; clasping the robe with the left hand and a lotus bud with the right hand. Late 19th/early 20th century. Provenance: Acquired 1968. Measurements: H 36". 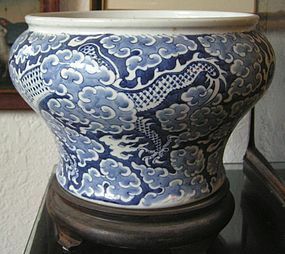 Very well decorated cachepot with dragon emerging from clouds. 19th century. Acquired:Prior to 1971. Measurements: H 9 1/2". 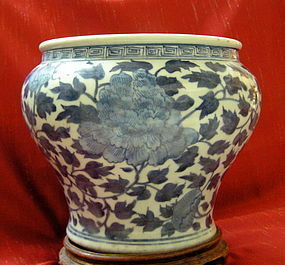 Very well painted blue white cachepot; decorated with large peony blossom on leaf scroll. Provenance: Acquired prior to 1971. Measurements: H 9". 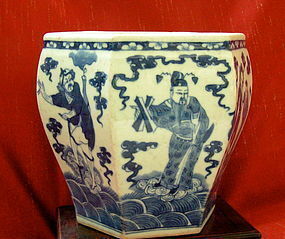 Hexagonal flower pot with very well decorated design of Eight Immortals. Provenance: Acquired 1968. Measurements: H 8".